Southern Christmas Table and Give-Away! Thank you to everyone for your kind wishes while we were under the weather around here. I appreciate being missed! 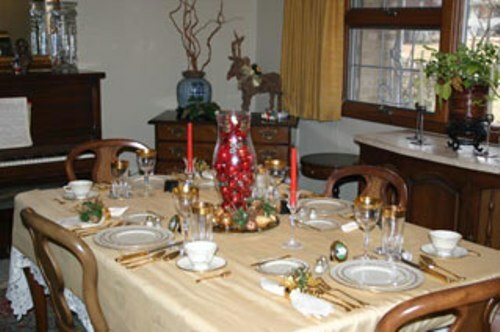 Today, I want to show you a Christmas table I did back when I first started blogging. I had not thought to post the pictures when I took them. I just liked the table and took pictures because I wanted to. Eventually, I discovered all this incredible tablescaping going on out in blogland and jumped in to join fun! Thanks to Susan for hosting! Unfortunately, at the time I didn’t take but a couple of pictures. Now, I know to get lots more! The china pattern is Golden Wreath by Lenox. Sorry the pics are not close enough to show a lot of detail, but if you look closely, you can see that I used little miniature frames for placecards. The centerpiece is just a hurricane that I filled with red ornaments and placed on a brass tray and surrounded with gold ornaments and greenery. I love red and gold together. Now, on to the give away! This wonderful treat is provided by Kountry Kupboard out of Jonesboro, Arkansas. Kountry Kupboard is a great bulk and specialty food item store. They have lots of hard to find baking items as well as just some really tasty stuff! To win this fabulous gift basket you have several ways to add to your chances! Go to the Kountry Kupboard website (http://shopthekupboard.com), look around and then come back here and leave a comment telling me what product at the Kountry Kupboard you liked best. Become a fan of the Kountry Kupboard Facebook page and then come back and leave a comment letting me know that you have done that. Become a fan of A Southern Life on Facebook and then leave me a comment letting me know. If you are already a fan, just go ahead and let me know that you are in the comments. Okay, so you can have up to 4 different chances to win! How fabulous is that? The winner will be announced here at A Southern Life on the morning of Saturday, December 18th. That this coming Saturday! Good luck! This just screams, “eat me for the holidays!” If you want to leave out the rum, you can just substitute a couple of teaspoons of rum flavoring in place of the rum. Preheat oven to 325 degrees F . Grease one 10 inch Bundt pan. Place chopped nuts in the bottom of the Bundt pan. With an electric mixer beat cake mix, pudding mix, eggs, oil, 1/2 cup of the water, and 1/2 cup of the rum on high speed for 2 minutes. Pour batter into prepared Bundt pan over the top of the chopped nuts. Bake at 325 degrees F for 50 to 60 minutes. To Make Rum Glaze: In a saucepan combine the butter or margarine, sugar, 1/4 cup of the rum, and 1/4 cup of the water. Bring mixture to a boil and cook for 2 minutes. Pour some of the glaze on the warm cake while it is still in the pan. Do this slowly so in can be absorbed into the cake. Turn the cake out on to a cake plate. Prick the cake several times with a fork. Drizzle the rest of the glaze onto the cake and let it soak into the cake. I’ve been to Kountry Kupboard twice in the last 2 days! They are a great store with lots of hard to find items! We love having them here in Jonesboro! That cake sounds wonderful! I’ve printed it out and I’m going to make it for Christmas Eve! another thing on their site that peaks my interest is the coconut macaroon cookie mix, it looks yummy! gorgeous holiday table, love the centerpiece idea too! Christi, glad to see you back. Your table is beautiful. Good luck to all of you with the giveaway. I won Christi’s last one and was delighted. My daughter and I had so much fun baking pies and having hot chocolate w/ peppermint while we worked. What a pretty table! I love the gold Lenox. They have the most beautiful china. Merry Christmas! Beautiful table. Love the Lennox china! Thanks for sharing! I went straight to the CANDY section! Seeing the Horehound candy reminded me of my precious grandpa. He’d keep a jar of these by his chair. I guess it was safe as none of us grandchildren liked them. The Salt Water Taffy looks yummy! Christi, like you, I have taken photos of special tables over the years, but I’ve learned so much from other bloggers about how to take more and better photos. I still have a lot to learn, though! Your china looks so pretty! I also like the ornament-filled hurricane — great look! Your entire tabletop make me very merry and bright! I would love to win the basket! A nice gift to myself! Will make the rum cake this weekend. Just became a fan of your blog on facebook! I went over to their website and saw something called Sticky Bun Smear that comes in a tub. That definitely interests me. And I have to say that the prices are great! Nice! Thanks for that recipe. I have bookmarked it and want to try it for a New Years Eve party next month. And please add my name to your giveaway…lots of great treats in that basket! Everything on the table looks great, and in the basket, too. The praline Tabasco peanuts sound intriguing—must be a sweet and hot sensation to taste! I need them because I have three sons with big appetites coming in for the holidays…Merry Christmas to all! FB, glad you are better. Merry Christmas! 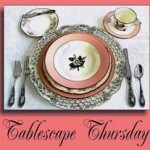 Isn’t it wonderful to find so many other “tablesetters” who share their tables week after week! Love your pretty basket of goodies. 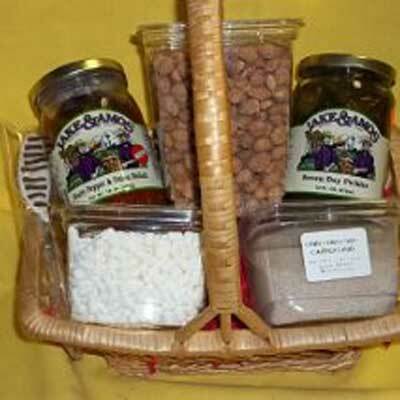 I love baskets filled with goodies, what a great giveaway!! thanks! I really enjoy your blog too! 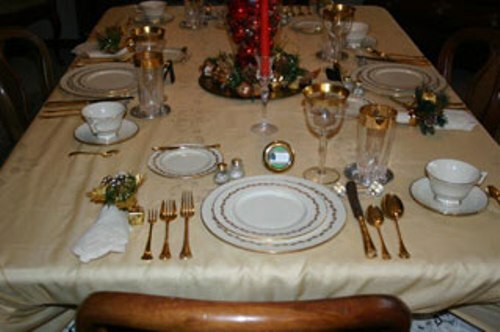 Christmas Dinner is at my house this year and you have given me some great ideas for my table. That is all I will be doing, my grown children will be cooking the dinner, since I just had surgery of a total knee replacement. Love your site and thanks for the chance to win a great goodie basket! Love your table. What truly beautiful china that is. I NEED SOME TABASCO PRALINE PEANUTS since I’m from the Southern part of Mississippi and call New Orleans part-time hometown! Love this new find! I liked their Red Mill grain bread mix, have “liked” their (Kountr Kupboard) page and already love yours.